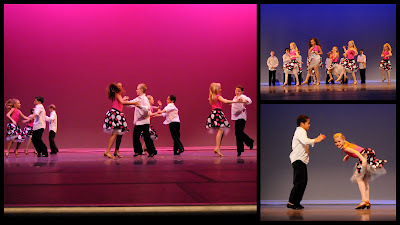 We had a really busy week- I had sales conference and the girls had dance performances on Monday, Wednesday and Thursday. The next few posts will be dedicated to each of the girls dances. Here are a few of the dances that the girls weren't in. Every year, VIBE does a concert that spotlights their professional company. They also bring in a lot of "famous" dancers. This year they brought several from "So You Think You Can Dance" and "Dancing with the Stars." Thayne and Chelsie were amazing! We saw Thayne perform in St George, and he was every bit as fun to watch at the MOVE show. This number below was my absolute favorite to watch. If you ever get a chance to see the MOVE show, it is definitely worth watching.